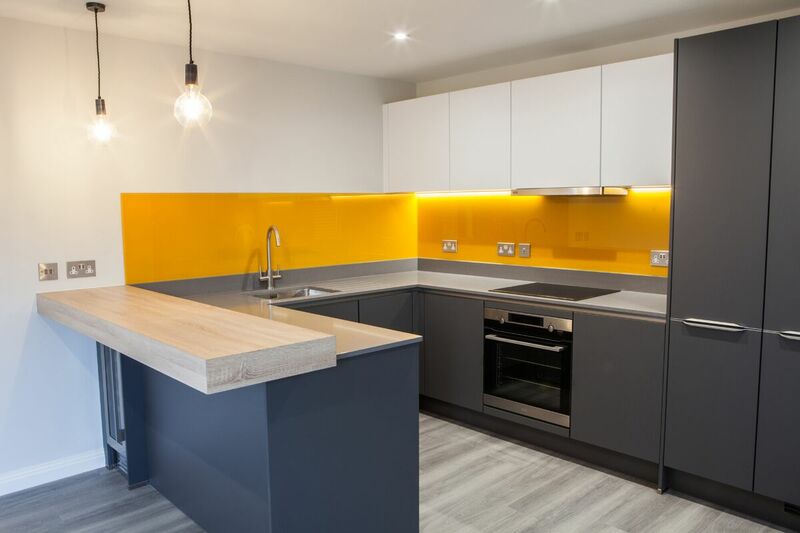 Our client for this project was building eight apartments and wanted quality affordable designs that would appeal to a broad spectrum of potential occupants and buyers. Their brief was for us to create eight individual kitchens, each one different but all with modern, clean designs based on a similar layout. As with several other projects , the style and materials chosen by the client were heavily influenced by our showroom display kitchens that reflect the popular contemporary market trends – but each with features individual to the clients’ particular vision. Integrated units, oven towers and wine coolers are all features that most people would expect to find in a modern kitchen and we were able to incorporate all of these elements and more into the kitchen designs. The trend of featuring the splashback areas of the kitchen in glass continues and clients are able to choose striking colours and patterns. 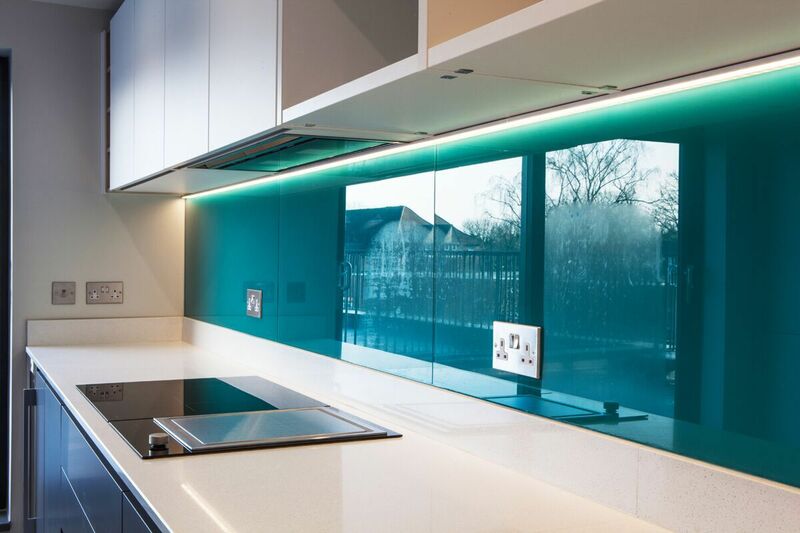 On this project, each kitchen has a different colour glass splashback, adding a stunning feature and reflecting light. Opting for a glass splashback in the kitchen offers more than just beautiful aesthetics: glass splashbacks have proven to be far more hygienic and much easier to clean than any other surface. 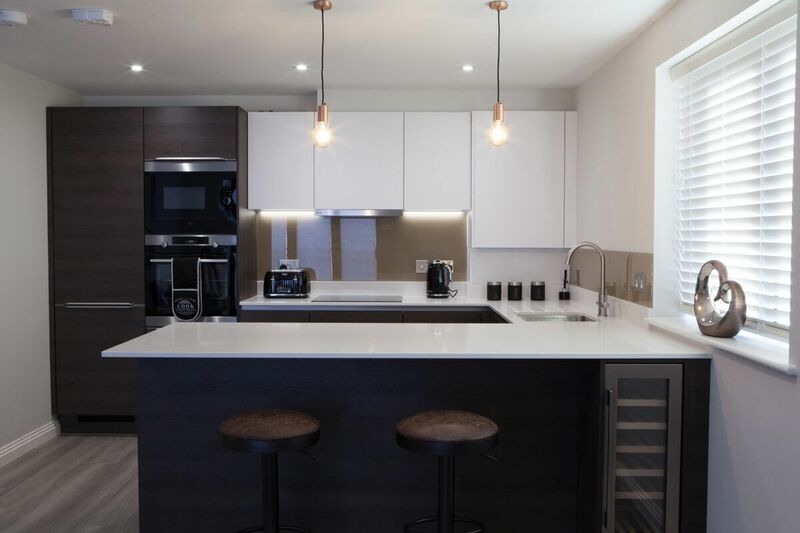 Mixing colours and finishes on the cabinetry adds depth – the Touch white wall cabinetry contrasts beautifully with the dark base units and complements the light stone worksurfaces and upstands. It was important for our client to have quality appliances at affordable prices and we were able to deliver on this using recognised manufacturers like AEG, Zanussi and Caple. 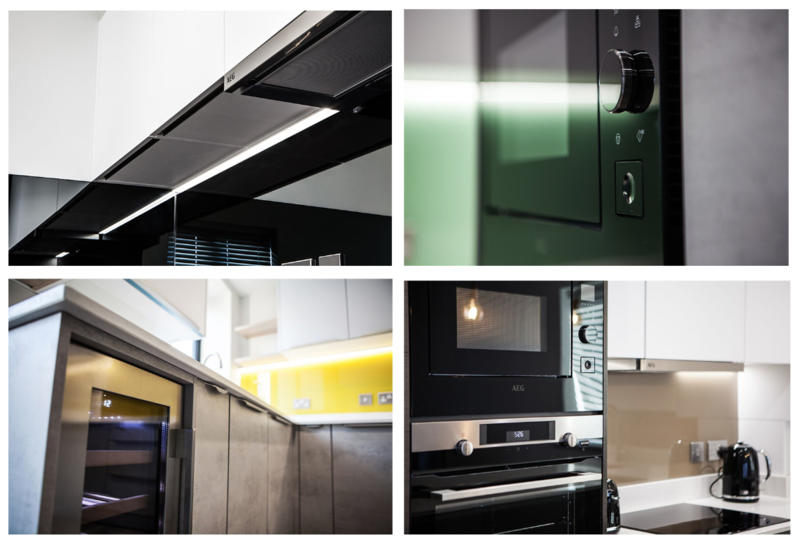 A mixture of handless and modern factory fitted integrated pull handles were chosen for the kitchen designs in order to maintain the sleek contemporary look the client wanted. Although this is a popular choice in recent times, the handless style is in fact a nod to the 70s – a period from which many of today’s interior design trends have been drawing inspiration. 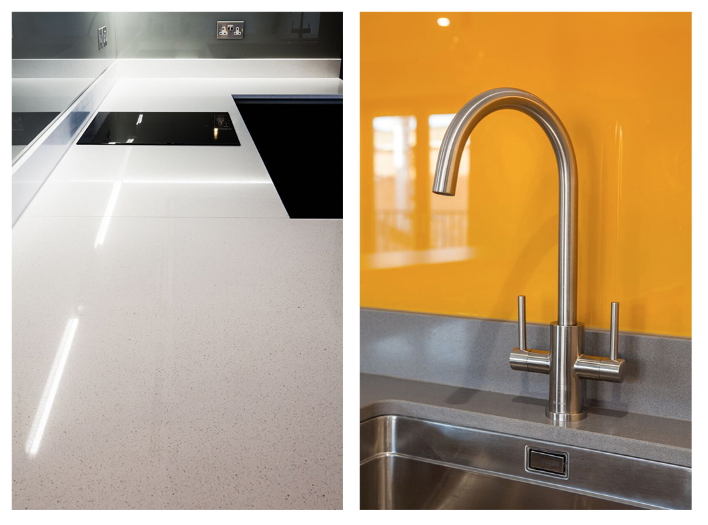 The worksurfaces and upstands we added are 20mm Gris Expo Silestone or Opus White Beltrami Quartz Surfaces – clean, hardwearing and beautifully sleek. 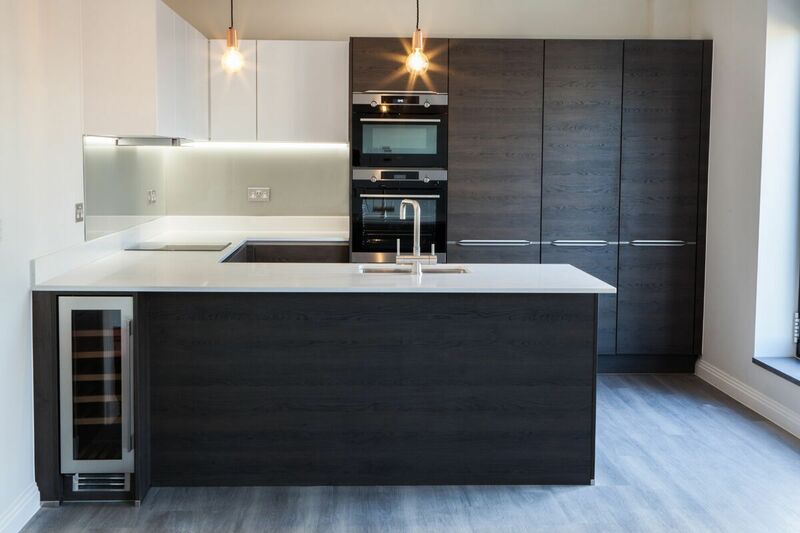 We really enjoyed designing the kitchens for this Chertsey project and were able to offer our advice based on years of experience designing for individual clients as well as for multiple home projects. Our passion is to design quality kitchens and home living spaces, interpreting the client’s vision, advising on how to achieve it and delivering it within budget.